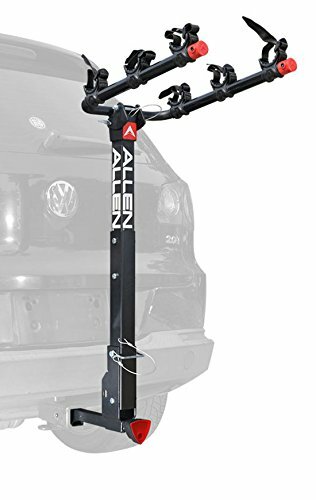 Carry up to three bicycles on road trips or camping guards with the allen three-bike hitch mounted carrier. The hitch insert-which fits 1-1/4- and 2-inch receiver hitches-is easy to operate and super secure for your bikes. Just attach it to your hitch, then use the tie-down cradle system to individually secure and protect your bikes. The carry arms accommodates a wide range of frame sizes and designs, so you can carry your kid-size mountain bike or Adult road bike with equal confidence. Some bicycles without a standard top tube may require an adaptor bar for installation. The rack tilts back for easy lift-gate access. Also equipped with a locking quick install hitch that keeps the rack from moving inside the hitch, the three-bike carrier is colored with a Black powder-coated finish. Never use on trailers.